Single Antler Shelf handcrafted with mule deer antlers set on Michigan Black Poplar that was cured two years. A polyurethane coat was added to finish this beautiful piece of Black Poplar. The woods slabs are angle cut to ensure no splitting. Screw holes are professionally finished. Each antler shelf is dated and signed so you can remember in 20 years where and when you purchased your unique piece. Each shelf is custom made. Due to the unique character of real antlers, each shelf varies. While each antler shelf creation is unique, they typically measure 27″ high x 12″ wide. 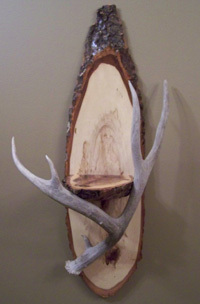 This Single Antler Shelf with mule deer antlers makes a great accent piece for cabin, lodge, or rustic decor. This unique piece brings nature to your cabin or lodge in a beautiful rustic way. All of the Antler Art pieces are handcrafted, custom creations – due to their uniqueness, no two are exactly alike. The antler artist is always available to work directly with you to select or design the proper piece for your needs. Professionally packaged and shipped within 24 hours of purchase.